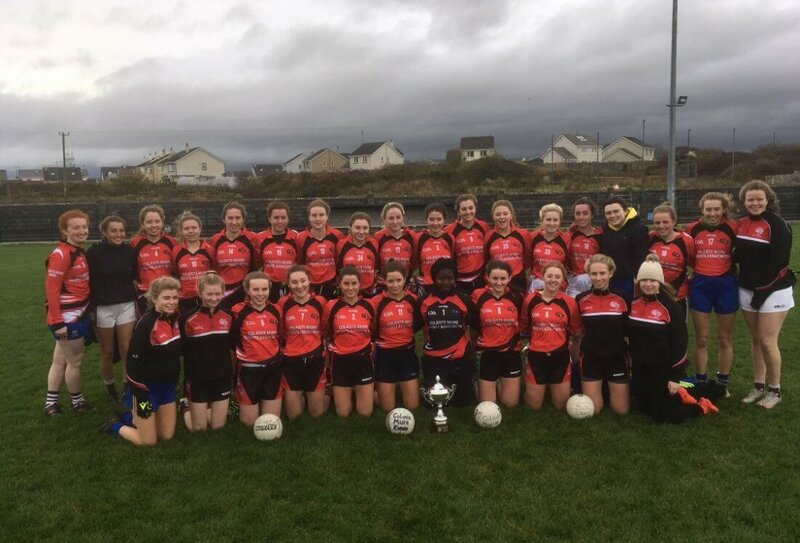 Colaiste Muire proved too strong for a gallant Kilmihil CC side in the Senior B ‘Johnny Hayes’ PP Schools Final last Wednesday in Kilmihil. Both teams served up an entertaining encounter in tough conditions as a strong diagonal gale made long accurate passing very difficult. Colaiste asserted themselves with early points from McDonagh and McCann before O’Loughlin coolly slid the ball low past the goalkeeper in the 7th minute. Katie Mullen responded in the 10th minute with a good point from play for Kilmihil before McCann, McGrath and O’Donoghue hit a point apiece from play by the 24th minute for Colaiste to lead 1-5 to 0-1. The game then looked like moving away from Kilmihil when Emma O’Donoghue coolly finished a penalty to the net after being hauled down inside the square. With Kilmihil now reduced to 14 for ten minutes Colaiste piled on the pressure but Kilmihil’s Caolfhinn Morrissey took a point from a tight angle in the 25th minute. At half-time Colaiste lead 2-5 to 0-2 having played with the wind. Colaiste kept up the pressure at the start of the second half with 1-1 in the first 5 mins. Kilmihil’s Corry replied with a point before O’Donoghue responded for Colaiste. Morrissey gave Kilmihil hope with a goal from a free floating in just under the crossbar in the 15th minute after a lot of pressure. But Colaiste responded with 3 excellent points from McCann (2) and O’Donoghue. The teams traded points again before Kilmihil’s possession was rewarded with a goal in the 27th minute. Colaiste responded again with the last 2 points from play from O’Donoghue and McCann to run out 3-13 to 2-5 winners of the Johnny Hayes Cup. Colaiste Muire: Nora Tchadjobo, Aoise Meaney, Meadhbh O’Connor, Shona Power, Bernadette Kelly, Laura Hayes, Muireann Collins, Aisling Reidy, Sinead McGee, Niamh McDongah, Kiera McGrath, Sarah McCann, Allanah Meaney, Emma O’Donoghue, Aoibhinn O’Loughlin. Subs: Ellie Rochford for Meaney, Ciara Lane for O’Connor, Moya Dune for Shona Power. Ava Cotter, Siun McNamara, Sinead Clancy, Muireann Byrne, Anna Nagle, Caitlin McKiernan, Jessica Latham Candice Brennan. Colaiste Muire’s 2nd Junior team was up against Kidysart CC on Tuesday last in Ballynacally. The Colaiste girls started stronger and had built up a strong lead by half time with scores from Aisling Costello, Ella Taylor, Charlotte O’Brien and Emma Considine. However with the introduction of county player Amy Murphy Kildysart came thundering into the game in the second half with 3 quick fire goals, 1 each from Amy Murphy, Sorcha Donnellan and Grace Shearer. Stout defending from Colaiste, including a series of brilliant blockdowns managed to stop the Kildysart tidal wave of attacking during a crucial period in the second half. A goal and a point after this for Colaiste was enough to see out the game and ensure victory. Best for Colaiste were forwards Aisling Costello and Charlotte O’Brien, midfielders Orla Hogan and Amelie Malice and defenders Hannah Doyle, Emer Hynes, Roisin Cahill. Rachel Daffy, Colaiste Goalkeeper also made a number of very important saves in the second half. For Kildysart Sinead Kelly, Grace Shearer, Chloe O’Shea and Holly Swire worked tirelessly over the hour, as did Amy Murphy when introduced. Colaiste Muire: Rachel Daffy, Laura Butler, Roisin Dillon, Ciara Sexton, Emer Hynes, Hannah Doyle, Roisin Dillon, Orla Hogan, Amelie Malice, Emer Hanrahan, Emma Considine, Charlotte O’Brien, Katie Arthur, Ella Taylor, Aisling Costello. Subs used: Ellie MacNamara for Dillon, Rebecca Carmody for Katie Arthur and Lauren Wall for Emma Considine. Lorraine Connellan, Hannah Clune, Aoife Byrne, Ellen McSherry, Rebecca McCarthy, Holly Deegan.